Beautifully engraved specimen certificate from Standard Gas and Electric Company dated 1927. 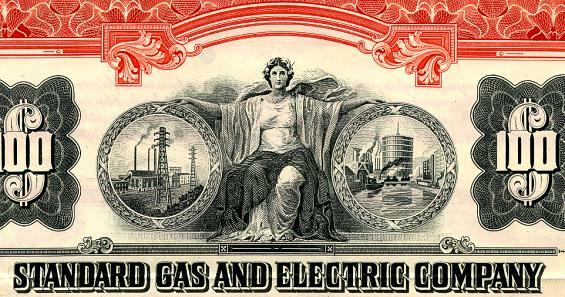 This historic document was printed by Columbian Bank Note Company and has an ornate border around it with a vignette of an allegorical woman next to electric power lines and power plants. This item is over 79 years old. 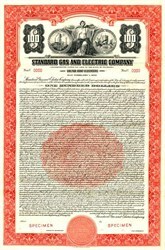 STANDARD GAS & ELECTRIC COMPANY (1923) History: Incorporated under Delaware laws, April 28, 1910, as a holding company for acquiring, selling or operating public utility properties. The company owns stocks, bonds and other securities of 14 public service corporations, serving 578 communities with a total estimated population of 2,250,000. The territory covered is located in Iowa, Illinois, Minnesota, Wisconsin, Oklahoma, Arkansas, North Dakota, South Dakota, Colorado, Montana, Idaho, Washington, Oregon, California, Alabama and Kentucky. Puget Sound Gas Company, Everett, Wash. Affiliated Company: The Standard Gas & Electric Company also holds a minority stock interest in the Northern States Power Company. SOUTHWESTERN GENERAL GAS CO.: Incorporated under Arkansas laws, September 7, 1911, and succeeded to the property and business of the Little Rock & Ft. Smith Gas & Oil Co., the Arkansas & Territorial Oil & Gas Co., the General Pipe Line Co., and the Mansfield Gas Co. The company owns and operates natural gas wells in the vicinity of Ft. Smith, Ark., and supplies gas to the Ft. Smith Light & Traction Co. Number of gas consumers, 133; miles of main, 25. Capital Stock: Authorized, $2,000,000; preferred and $2,000,000 common; outstanding, $25,000 preferred and $1,001,000 common; par $100. Entire preferred and common stock, excepting directors' qualifying shares, owned by Standard Gas & Electric Co.
Management: OFFICERS: (Standard Gas & Electric Co) : H. M. Byllesby, Pres. ; A. S. Huey, G. H. Harries, B. W. Lynch, J. J. O'Brien, C. C. Levis, F. C. Gordon, Vice-Pres. ; R. J. Graf. Sec. and Treas. ; M. A. Morrison, Herbert List, P. A. Lehmkuhl, W. G. Pohl, J. J. Madden, L. M. Sage, Asst. Sec. and Asst. Treas. DIRECTORS: H. M. Byllesby, A. S. Huey, J. J. O'Brien, R. J. Graf, M. A. Morrison, J. H. Briggs, R. G. Hunt, H. C. Cummins, D. T. Flynn, B. W. Lynch, Donald McDonald, A. S. Cummins, J. H. Roemer, F. W. Stehr, C. C. Levis, 0. G. Corns, W. G. Pohl. ANNUAL MEETING: Third Wednesday in April at Wilmington, Del. EXECUTIVE OFFICE: 208 South La Salle Street, Chicago, Ill.